We are a reputed manufacturer and supplier of Emamectin Benzoate 1.9% EC. We are offering Difenthiuron-50% WP Pesticide to our clients. It is used to control whitefly and other sucking pests as well as mites in various crops. It is a highly effective systemic insecticide for the control of aphids, jassids and whiteflies in cotton, chillies, cabbage and okra crops and brown plant hopper in rice crop. We are one of the prominent processors and suppliers of Alphacypermethrin 10% EC. Highly active insecticide used to control a wide range of chewing and sucking insects in fruits, vegetables, vines, cereals, maize, beet, oilseeds, cotton rice, soybeans, forestry and other crops. 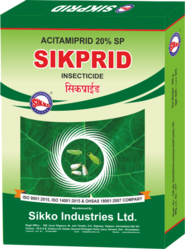 Sikkorin Pesticide offered comes with a constitution of Cypermethrin-25 % EC. Being broad spectrum it affords control over all sucking, biting, chewing pests. It has greater effectiveness against all Lepidopteran pests. We are one of the prominent processors and suppliers of an extensive range of Deltamethrin 11% EC. 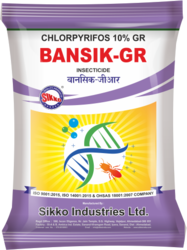 We are the Manufacturer and Industrial leading supplier of Sikko DDVP Pesticide. It instantly kills the Sucking & Chewing insects such as Plant hoppers, Semi-looper. Due to small waiting period, it can be sprayed on vegetable crops just two days ahead of picking/ plucking the vegetable. 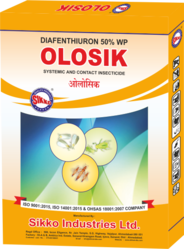 O-Claim is Best pesticide contains Emamectin Benzoate-5%. We are offering Fipronil 0.3% Gr. to our clients. 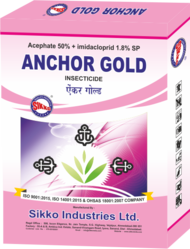 We are the Industrial Leader ensure the Quality Sikkomida Pesticide. It is used as a foliar spray for the control of sucking and other insects in different crops. Broad crop and pest spectrum. We are the manufacturer of Lemsik Pesticide. 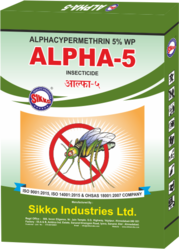 It is used as Broad spectrum for control of wide range of pests in variety of applications. Pests controlled include aphids, and butterfly larvae, Jassids, Thrips, Stem Borer, Fruit borer, Leaf folder. We are the manufacturer of Malasik Insecticide. It is formulated as an emulsifiable concentrate, is a non-systemic, broad-spectrum organophosphate insecticide / acaricide, with contact action on the stomach and respiratory tract pests of stored crops: mites, aphids, bugs etc. Neemsik is a Neem based biopesticide with a blend of 10,000 ppm Azadirachtin and Neem oil, providing all the limonoids for an effective insecticidal action. We are one of the prominent processors and suppliers of an extensive range of Permethrin 25% EC. We are the Leading manufacturer of Profenophos-50% Pesticide. Mode Of Application : It is mainly is applied as a foliar spray in crops for killing pests such as white flies, thrips. We are one of the leading manufacturer and supplier of Propargite 57% EC.We obligated to meet the quality standard as per the customer demands. 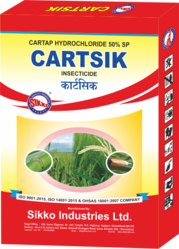 We are the manufacturer of Sikmite Insecticide. The provided product is used in agriculture sector for controlling mites in the crops. 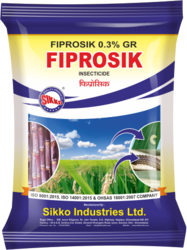 Trisik - Triazophos 40% EC Insecticides that are broadly used for the protection of rice, vegetables, cotton, sugarcane and soyabean. We are the Manufacturer and Industrial Leading supplier of Acephate 50% +Imidacloprid 1.8% SP. We are providing Buprofezin-25% SCto our clients. We are leading manufacturer of Cypermethrin+Profenophos combination. We are offering Midasik Pesticide to our clients. We are the industrial leader our belief in quality dealing into Sikquin Pesticide. We are the manufacturer of Thiomethoxam. We are the leading Manufacturer and Supplier of Azadirachtin 0.030% (300 PPM). 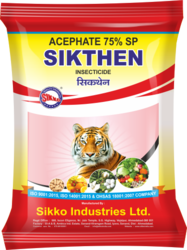 We are offering Acephate-75% Insecticide to our clients.